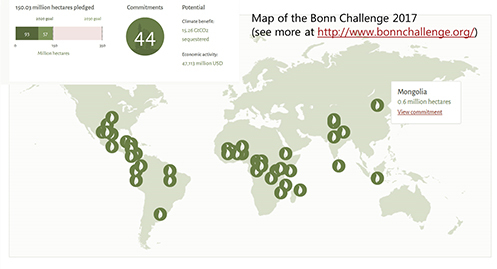 The international movement called “The Bonn Challenge” has since 2011 worked to initiate the restoration of more than 150 million ha of degraded forest lands throughout the globe. This corresponds to a land area which is 35 times the area of Denmark. The University of Copenhagen contributes to this work. Restoration of forests is one of the most economical and effective methods available to mitigate climate change, both through the reduction of CO2 and other greenhouse gases in the atmosphere, and through adaptation of agricultural systems to a changing climate. Together with The International Union of Forest Research Organizations (IUFRO). Researchers from Department of Geosciences and Natural Resource Management (IGN) contribute to develop science based guidelines for forest landscaper restoration. "It is a task of giant dimensions for the whole world, which in many ways corresponds to the transformation Denmark went through more than 200 years ago. The Danish people suffered from the landscape degradation through poor site fertility as well as wind and soil erosion. Only visionary efforts supported by new technologies and access to fossil energy ensured the restoration and improvement of both forests and farmlands, which became the backbone of the productive Danish landscapes and an important pillar in building and supporting the modern rich society". The practical implementation of forest landscape restoration requires seeds, plants and seed sources in large quantities as a basis for both plantation and natural regeneration, to counteract water and wind erosion, rebuilding soil fertility and promote economically and ecologically sustainable production of food, fodder and wood for various purposes. "Denmark has special prerequisites for contributing to this work both because of our domestic historical experience, but in particular because Danida for almost 50 years from the mid-1960s until the first decade of 2000 supported the built-up of Danish competence to assist with this type of work in the tropics as part of Danish development and environmental assistance". "Today, where Danida no longer supports this type of work, countries such as Germany and Norway have taken over, but Danish expertise is still being sought. 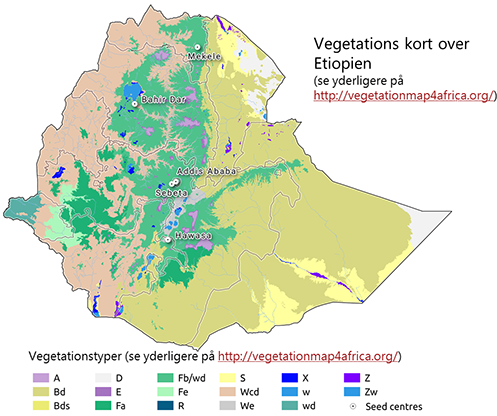 Norway has just granted what corresponds to more than 50 million Danish crowns for a forest seed program in Ethiopia, which will support the recovery of more than 15 million ha degraded landscapes in Ethiopia". The World Agroforestry Centre, with headquarters in Nairobi (http://www.worldagroforestry.org/), is together with advisors from IGN and local institutions in Ethiopia responsible for implementing this program in the next 4-5 years.